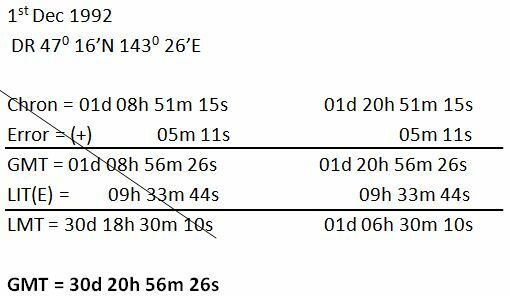 On the morning of 1st Dec 1992, in DR 470 16’N 1430 26’E, the sextant altitude of the Polestar was 4607’ at 08h 51m 15s chron time (error 05m 11s slow). If IE was 2.1’ off the arc and HE was 17m, find the direction of the PL and a position through which it passes. 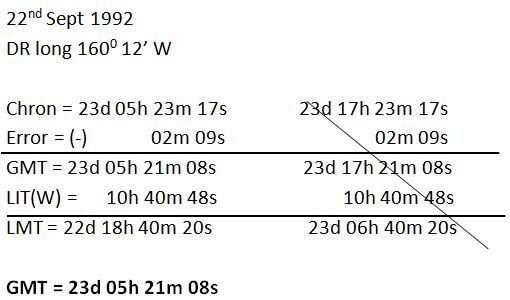 In the evening of 22nd Sept 1992, a ship in DR long 1600 12’W, found the sextant altitude of Polaris to be 3606’ at 05h 23m 17s chron time (error 02m 09s fast). 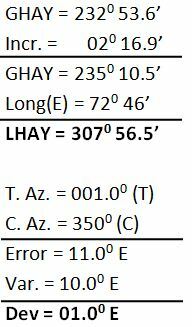 If IE was 2.8’ on the arc and HE was 10m, find the direction of the PL and the latitude where it cuts the DR longitude. 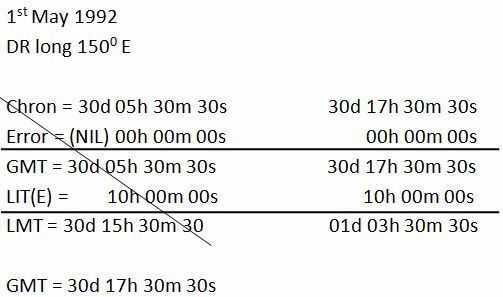 At about 0330 ship’s time on 1st May 1992, in DR longitude 1500E, the observed altitude of Polaris was 500 8’ bearing 0050 (C) at 05h 30m 30s by chron (error nil). HE 14m var 10E. Find the deviation of the compass, the direction of the PL and a position through which to draw it. On 6th March 1992, at 0200 ship’s time in DR 37’N 000 00’, the Pole star bore 3650 (C). If variation was 3.70W, find the deviation of the compass. 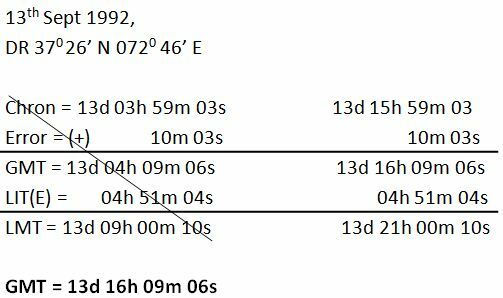 On 13th Sept 1992, PM at ship in DR 370 26’N 720 46’E, the Pole star bore 3500 (C) at 03h 59m 03s by chron (error 10m 03s slow). If variation was 100E, find the deviation for the ship’s head. Correction for exercise no. 2. The true az is 000.9 degree (t) not minute.